Adventures aren’t always far from home, so although I am a little light on the extreme endeavors at the moment, I’ve been testing this GSI Crossover Kitchen during my kitchenless travels. It’s funny, because I’m not much of a cook and I don’t own too much kitchen stuff to begin with, so when I realized that I had everything I needed in this little bag, I was really into it. With this and the GSI Bugaboo cookset I tested last year, I’m in good shape to keep myself alive. If I didn’t have this, I guarantee I’d be on 24/7 cereal. This little set has a nearly full-size flipper, tongs, and cooking spoon that fold up and stow away, along with a small handheld spatula. A dropper bottle, squeeze bottle, and salt and pepper shaker allow you to bring along your favorite spices (though I admit I don’t understand the dropper, unless I missed out on the GSI Martini cookset and I’m supposed to be using that for my vermouth). A little cutting board rounds out the cooking gear nicely. 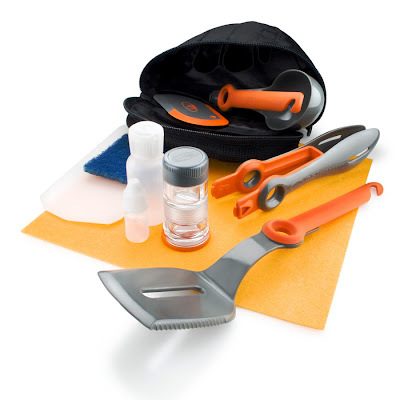 The inner pocket holds a pot scrubber and towel for cleaning up and the whole shebang fits in a nice lightweight pouch. I was also given a GSI French Press to try out, and I’m a total convert. Like I mentioned, I don’t buy things for the kitchen so I had been using a super cheapo camp french press (that, although cheap in construction, hadn’t been too cheap to buy, way to go big box stores of the outdoors) which had been acceptable but allowed a lot of coffee grounds to squeeze through. The GSI versions are really quality, with a very tight seal between the plunger and the sides of the pitcher, so no grounds end up in your coffee. The lightweight plastic pitcher is easy to clean and comes with a thin neoprene sleeve, apparently to keep the coffee warm, which works OK I suppose. It’s not like a thermal carafe or anything but it works all right. 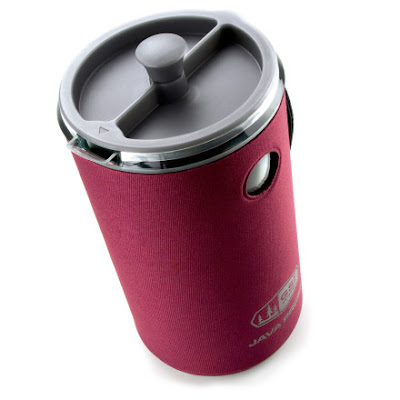 I use this to make even my home coffee, but for camping it comes in a smaller personal size so you don’t have to schlep around a giant french press. Once I had a near disaster when the plunger came unscrewed from the actual press part, but the coffee that resulted was still ok but for a few random extra coffee grounds floating in it. 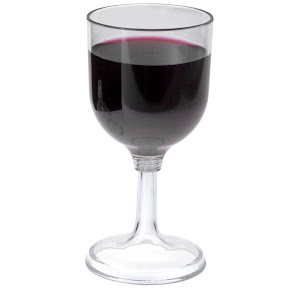 The GSI Nesting Wine Glass is a luxury camp item that I rarely travel without. I’d be that mountaineer in the death zone getting nasty articles written about me because I’m such a princess that I need to bring a wine glass with me, but I don’t actually care because it’s so nice to have it along. I don’t really like drinking wine out of tin cups or dirty bowls with the remnants of the morning cheerios floating in them, and it weighs so little that bringing it along is not difficult. It adds that little touch of class to paddling and camping trips, so why not? I’ve had mine for probably four years now and it’s still going strong, so I thought I’d include it in this article even though it’s not a new product from GSI. So now pretty much my entire kitchen is made out of GSI camp cookware. Actual camping is going to be a breeze because I’ll have my normal supplies along! All of the pictures above are affiliate links so if you click on them and then buy the stuff from that retailer, I eventually get a few coins of my own as a commission. Such a deal! Jill, we were just at REI last night looking at cooksets for the upcoming trip. Nice timing, my friend! I have the french press as well and I love it! I actually use mine a lot at home because I find making coffee to be a little annoying while camping especially with all the grounds. It does work really well – probably better than any french press I’ve ever bought for my house!